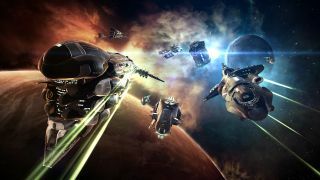 The interstellar MMO EVE Online has received its biggest update of 2015 in the form of Operation Frostline, which sees the mercenary faction Mordu's Legion continuing its military actions against the stumbling Serpentis Corporation. Operation Frostline adds 13 new ships to the game, which developer CCP says is the largest single introduction of new ships that it's had in years. Among them are the Command Destroyer, which can use "Micro Field Generators" to pull all nearby sub-capital ships with them on short, 100-kilometer jumps that enable formations to move quickly into and out of combat, and the Endurance, a deep-space ice-mining frigate designed to work in "the most lucrative null-security regions." The update also brings into play a number of major graphical improvements including kill tallies on each ship, rust and dust accumulation on hulls, new damage and engine effects, and quite a bit more. Possibly even more important than what it adds to the game is that it readies it for the Citadel expansion that's set to come out in the spring of 2016. CCP says the "massive" expansion "will reconstruct the very foundations of the famous sci-fi universe and transform the sandbox game design it is built on." Sounds big. More information about Operation Frostline can be found on the EVE Online site, or in the far more detailed patch notes. For more fun (and a bit of insight into why EVE players are so fiercely dedicated to it), don't miss Murder Incorporated, our retelling of the 2005 assassination of Ubiqua Seraph CEO Mirial, a hit that took ten months to set up and one word to execute.